Hillary Rodham Clinton’s attorney has agreed to provide the FBI with the private server that housed her e-mail during her four years as secretary of state, Clinton’s presidential campaign said Tuesday. Her attorney also has agreed to give agents a thumb drive containing copies of thousands of e-mails that Clinton had previously turned over to the State Department. The FBI has been looking into the security of Clinton’s unusual private system, which has emerged as an issue in her campaign amid growing questions from Republicans and some U.S. intelligence officials about whether government secrets might have been put at risk. The development in the FBI inquiry came the same day that a top intelligence official whose office has been reviewing some of Clinton’s e-mails informed congressional leaders that top-secret information had been contained in two e-mails that traveled across the server. The finding, contained in a letter sent to leaders of key oversight committees, marked the first indication from government officials that information regarded as top secret — the government’s highest category of security designation — may have passed across Clinton’s server while she led the State Department. Nick Merrill, a Clinton spokesman, said Tuesday night that Clinton is cooperating with the FBI probe. He declined to say whether the FBI ordered that she turn over the devices and when her attorney, David Kendall, had done so. The inquiry by the FBI is considered preliminary and appears to be focused on ensuring the proper handling of classified material. 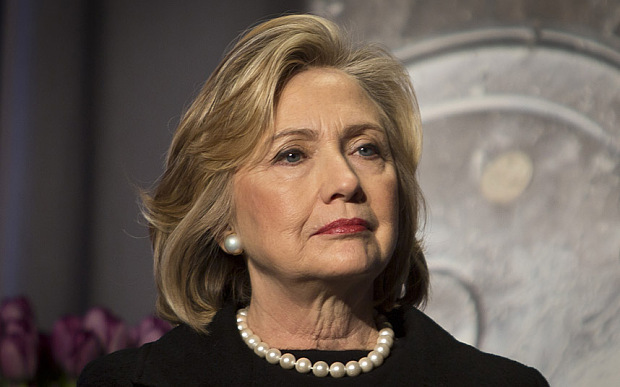 Officials have said that Clinton, the Democratic presidential front-runner, is not a target. The FBI’s efforts have included contacting the Denver-based technology firm that helped manage the Clintons’ unusual private ­e-mail system. Clinton turned over more than 30,000 e-mails from the account to the State Department in December, and the agency is vetting those messages for release to the public. She has said that she deemed an additional 32,000 ­e-mails to be personal and chose not to keep them. Kendall told a congressional oversight committee in a letter that there was “no basis” to support a third-party examination of the server. He indicated that he had confirmed with IT staffers that no e-mail sent or received by Clinton’s account while she was secretary of state remained on the server or backup systems associated with the system. “Thus, there are no hdr22@clintonemail.com emails from Secretary of State Clinton’s tenure on the server for any review, even if such a review were appropriate or legally authorized,” he wrote. Meanwhile Tuesday, 17 House and Senate members from both parties were informed about the presence of “top secret” information on the Clinton e-mail system in a letter from the inspector general for the intelligence community, I. Charles McCullough III. The letter was first reported Tuesday by the McClatchy news service. Much of the classified information in the e-mail conversations originated with the CIA, according to two government officials familiar with the records. Some of the information was deemed to be classified by the National Geospatial-Intelligence Agency’s classification guidelines. The information included references to information related to satellite images and electronic communications, according to the officials. The findings by McCullough stemmed from his office’s review of a sample of 40 of Clinton’s ­e-mails. Previously, he had said that the sample included four classified e-mails, but on Tuesday he adjusted his assessment — saying that intelligence agencies deemed two of those e-mails to have contained top-secret information. McCullough has asked for access to all of the e-mails to conduct a more thorough review but was denied by State Department officials in July. McCullough also located two e-mails that included classified material from among a separate batch of 296 related to the 2012 attacks on U.S. outposts in Benghazi. One of those e-mails had been publicly released by the State Department, causing consternation within the intelligence community. He has also located one additional e-mail in the sample of 40 that was classified at the time it was sent but has since been declassified, suggesting that there is no longer a reason to protect the information or that it has since become public, two people familiar with the finding said. McCullough also told lawmakers that his reviewers found two e-mails they believe contain information that the State Department considers classified, and they have alerted the agency so it can conduct its own review. All told, McCullough has pointed to seven e-mails that he said contained classified information, including two with top-secret material. His findings appear to contradict Clinton’s earlier comments. “I am confident that I never sent or received any information that was classified at the time it was sent and received,” she told reporters last month in Iowa. Clinton said she had “no idea” which e-mails have caught McCullough’s attention.